I'm not entirely certain what this UFO book is exactly; the site where I discovered it had it listed as a French (though it looks - as a couple folks have pointed out - Italian) "Photo-novel, presumably an adaptation of the episode, "A Question Of Priorities." But any piece of UFO artwork that has Straker punching out an alien astronaut on the moon - without a space suit! - is just too friggin' cool not to post here at Space: 1970. Man, Straker is a badass. 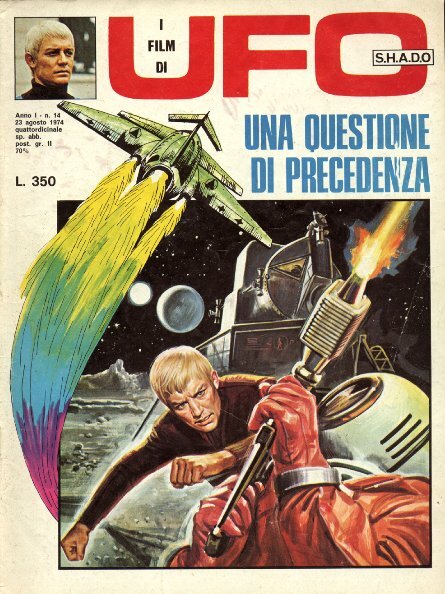 ADDENDUM: According to Space: 1970 reader Roberto Baldassari, ‎18 photo-novelizations from UFO were released in Italy In 1974. Seven of them were also released in France. This appears to be one of the Italian editions. My question is: how much of a badass is Straker on the other covers? Straker is the man. Even in some of the episodes with weaker writing he could also improve it just be showing up and getting everything done. Never saw this show until like two years ago, but I now watch the epsiodes fairly often. An armed alien astronaut too! BTW I love the image of the Colonial Vipers above "About this blog". I've always liked Straker. This was a commander who knew how to command, not like those softies like Picard or Janeway. The only other guy who came close was Sisko, who you know could and would knock your block off if you interfered with his mission. Even Kirk (the one, the original - not that Pine impersonator) wasn't as ruthless as Straker. Sure, he'd shoot you if he had to, but he'd feel bad about it. Straker really wouldn't care. But still, Straker isn't as badass as James Bond in the next entry below. Just look at that poster. Not only is Bond in space without a helmet, he seems to be achieving orbit without the aid of a spacecraft. Move over, Superman, here comes 007! I recall enjoying a lot of sci-fi TV series as a kid in the late 60s and well into the 70s, and some of them were pretty cool, but for some reason UFO had the coolest vibe of any of them. All the right elements sleekly blended with, if memory serves, a dash of hard-boiled cynicism for good measure. Loved it. The STAR MAIDENS (1976) Have Landed!